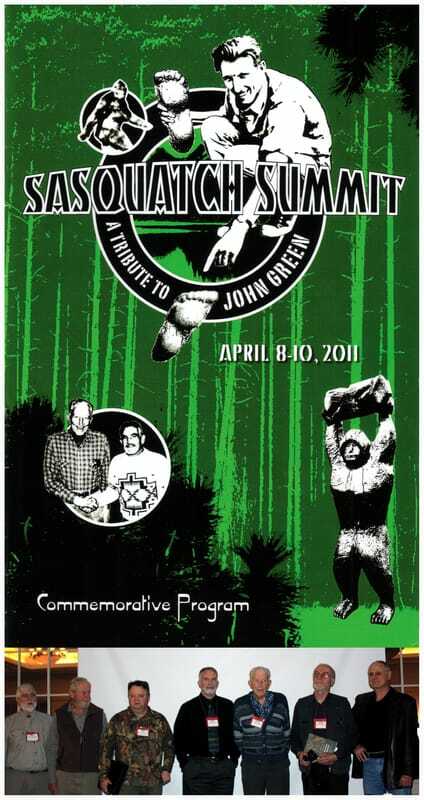 Thank you for visiting Sasquatch Canada. 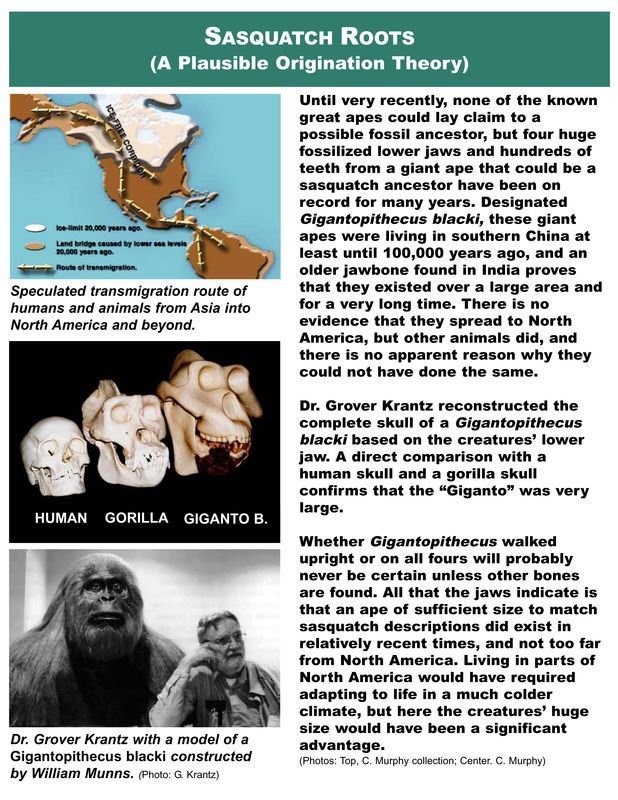 This website contains current and authoritative information on sasquatch and other homins. Our main objective is to get more scientific involvement in our research and hopefully resolve the many questions we have on these intriguing beings. We would appreciate your help by recommending our website to others and thereby increase the readership scope of the information provided. We hope you enjoy our presentations. 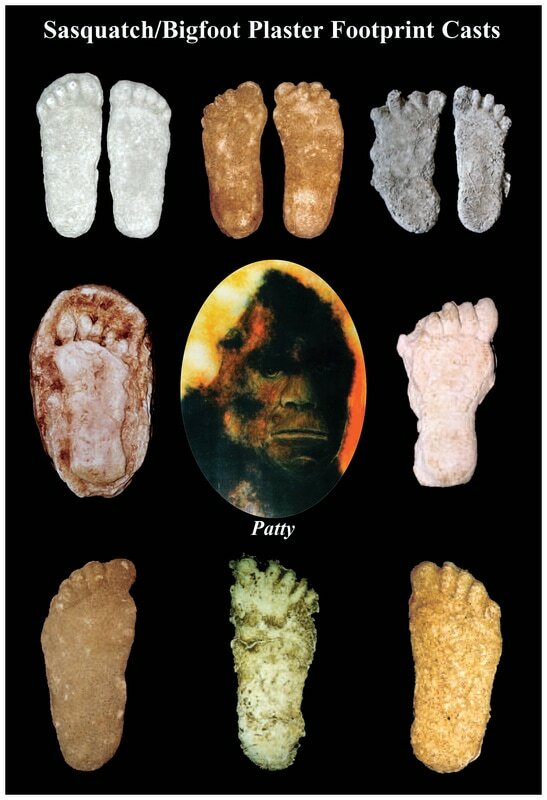 Shown here are artistic creations of the five primary homins in the field of Hominology. 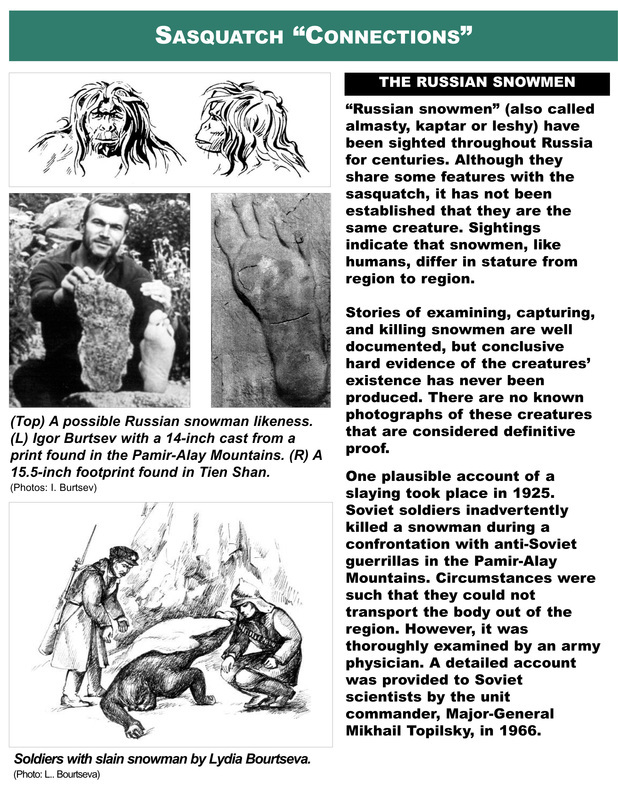 Much has been documented on the first four (sasquatch, yeti, Russian snowman, yowie) and they have many similarities. The last (yeren) does not appear to be as closely related and there is less information on this homin; but steadily increasing. They each have their own region in the world and have many different names within their specific regions, which can cause confusion. Please keep this in mind when reading material in books, magazines, newspapers and on the Internet. 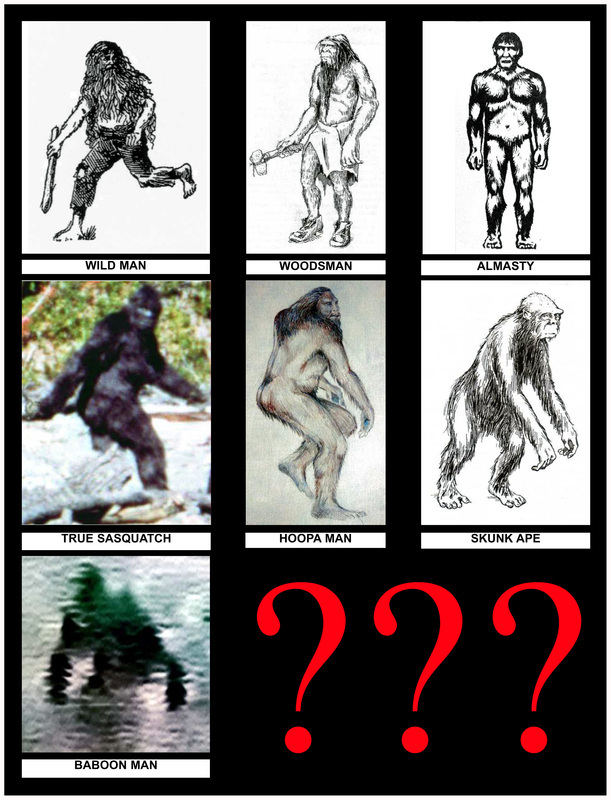 SASQUATCH CANADA includes all of these homins in papers and presentations because it is believed they are related in all, most or some respects. Dr. Igor Burtsev (b. 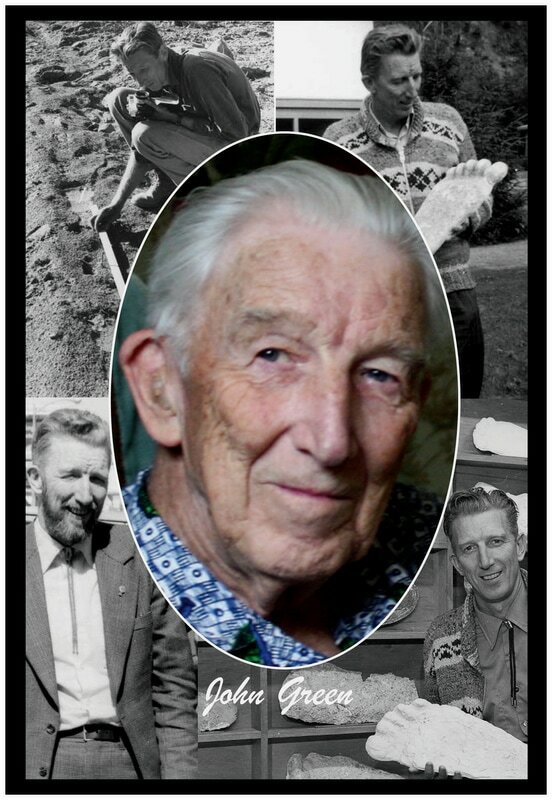 1940) commenced his study of hominology in Russia in 1965. He finished his education in 1977, graduating as a Candidate of History (equivalent to the North American PhD). During this time and to the present, he has traveled extensively in Russia and the United States researching the Russian snowman and the sasquatch or bigfoot. 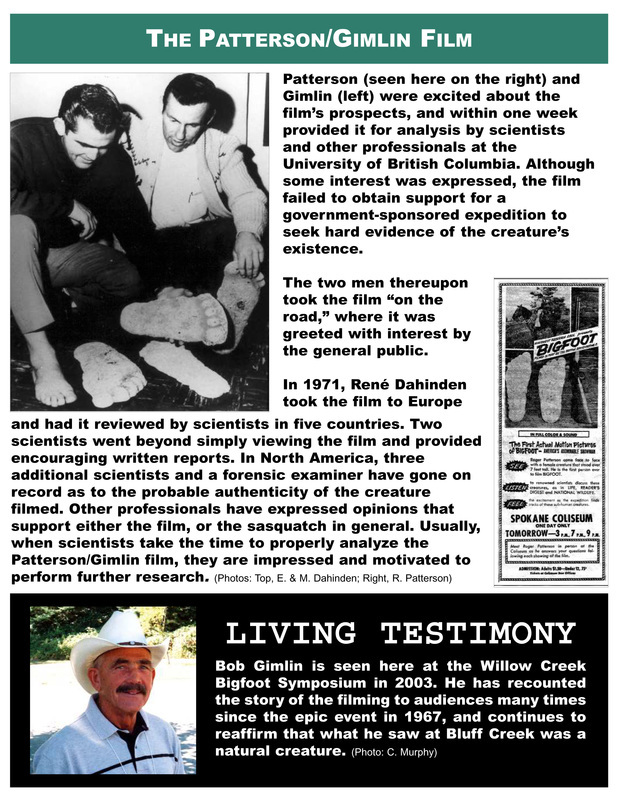 In 1972, he and Dmitri Bayanov were the first to thoroughly analyze the Patterson and Gimlin film, which they declared shows a natural hominoid being. Dr. Burtsev has written many articles on hominology and is currently working on a comprehensive book on his findings. 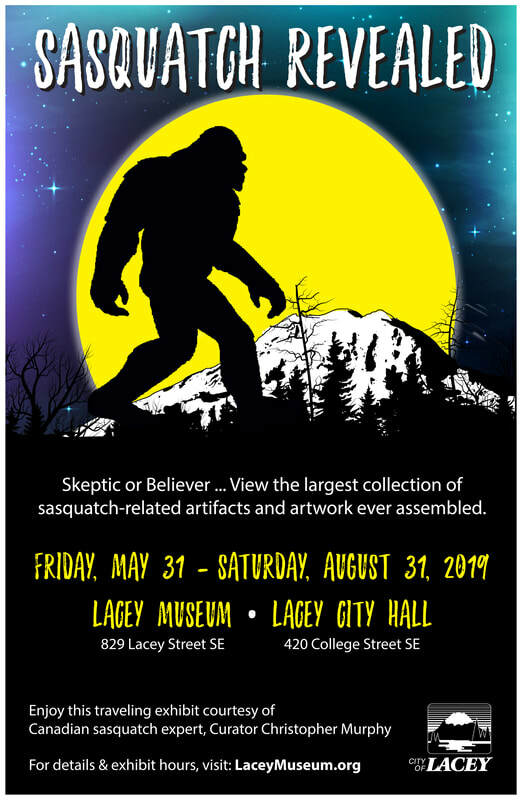 He has agreed to allow Chris Murphy to edit and format the papers, which will comprise his book, and post the papers to the Sasquatch Canada website. You will find Igor’s material both fascinating and an important indicator of hominoid reality in Russia and North America. The papers will be posted as finalized. 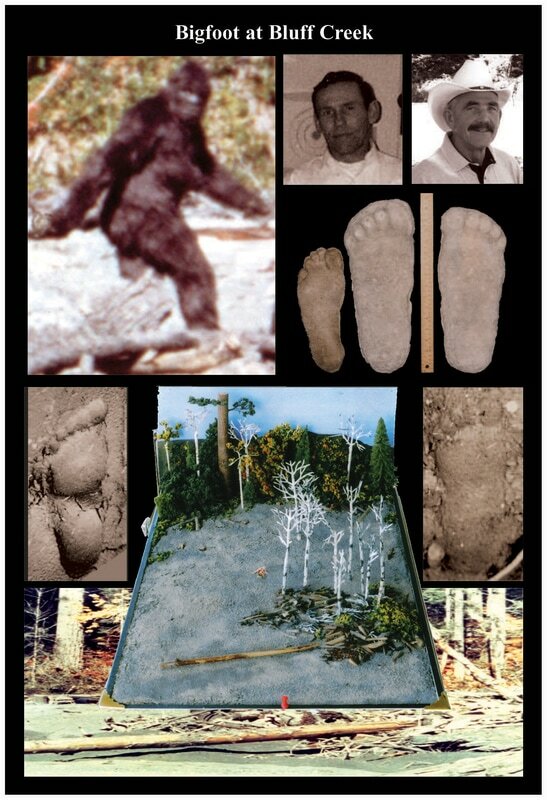 This remarkable presentation by Gene Baade from personal research might confirm that some sasquatch have 6 toes, which occurs in a small percentage of humans. Gene provides a complete photographic report on the unusual and intriguing case. 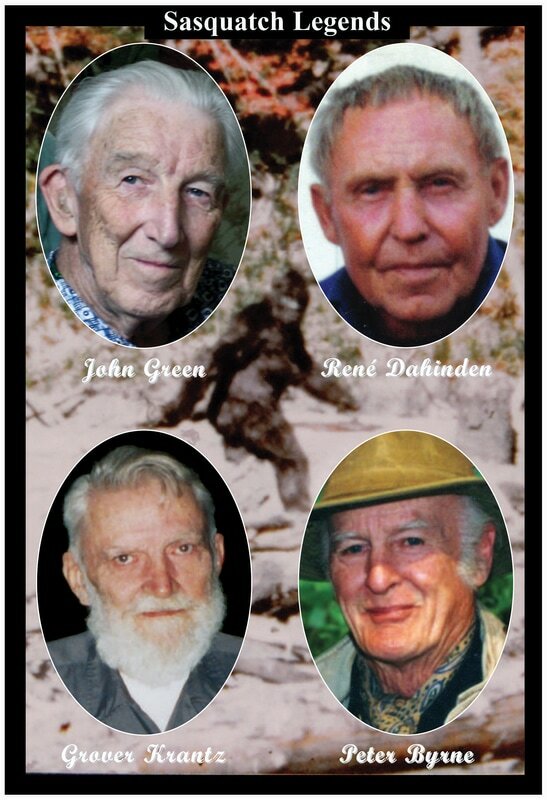 Since the sasquatch and other homins sparked the interest of professionals in the 1960s, the greatest proponent of sasquatch reality was Dr. John Bindernagel (died January 2018). He wrote two books pro-claiming that the evidence he collected over decades confirmed this homin’s reality. He also studied the Russian Snowman and again attested to its existence. In 2011 he attended a conference on Hominology in Russia. He delivered likely the most profound paper on his life’s work and discoveries. 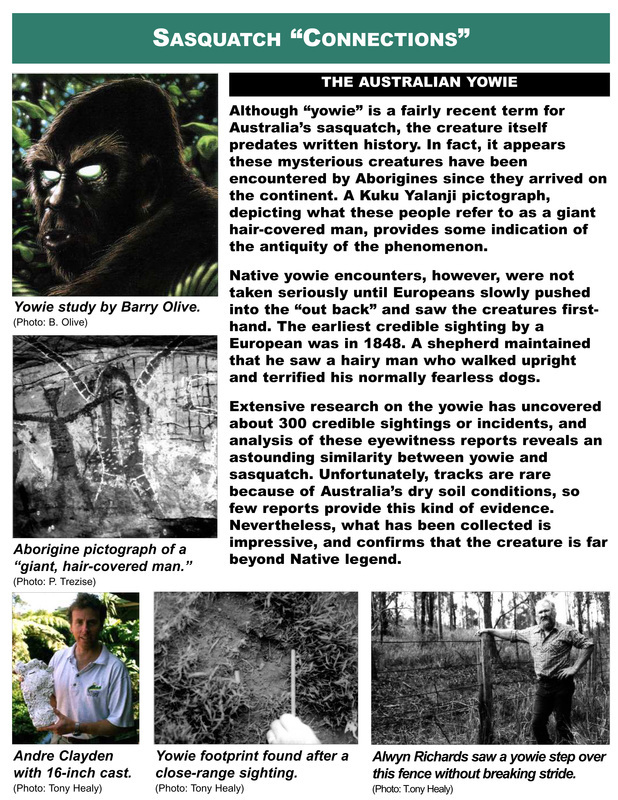 With the assistance of Dmitri Bayanov and Igor Burtsev I am pleased to present this paper on the Sasquatch Canada website. I urge all to intently study this paper; especially scientists because John was one of their own. About 12 years ago Chris Murphy and David Hancock teamed up to create a photo library. We have numerous images of interest to book authors, magazines, newspapers, and television producers. Our collection is provided here on contact sheets (just enlarge for a better view). 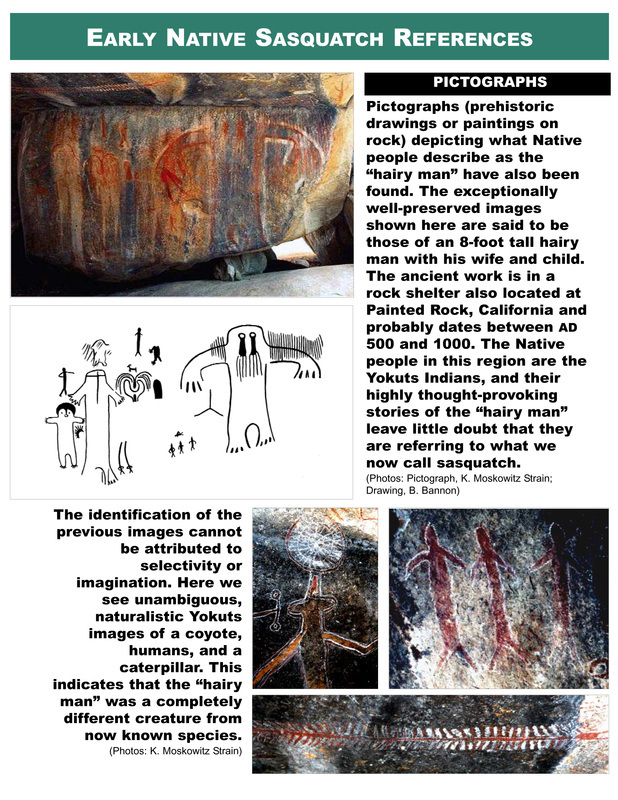 The images are in separate categories (Footprints in Sand/Soil, Footprint Casts, Hand Prints and Casts, Native Art and so forth. They are separated by a marker. If you are interested in using an image, please contact Chris (cmurphy101@shaw) for the cost and other details. ​NOTE: You are welcome to just browse the images for interest. They provide a glimpse into the history of hominology. There are many images that need to be added; which will be done continuously, so visit now and then and have a look. ​Is A Greater Paradigm Shift Thinkable? 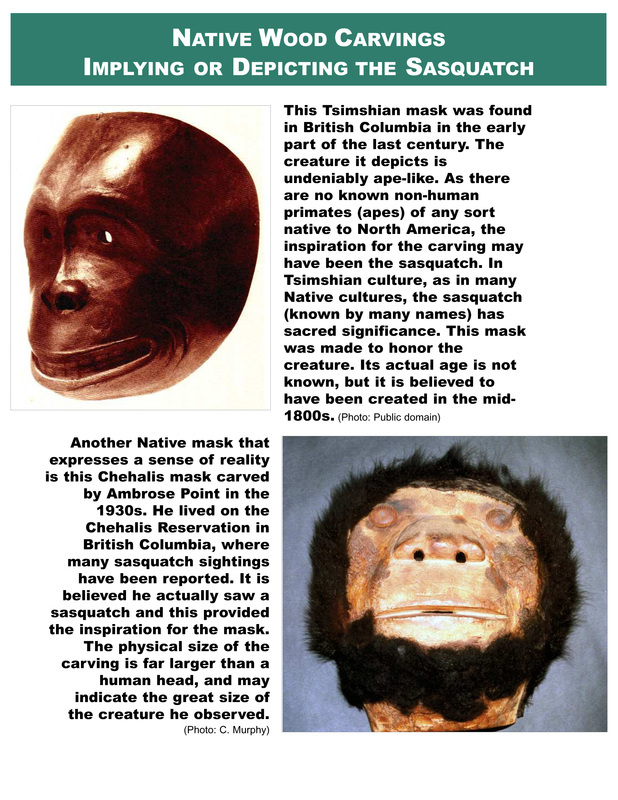 ​This article by Dmitri Bayanov addresses the continuing and difficult issue of the relationship between conventional science and what is termed the “paranormal” in sasquatch research. 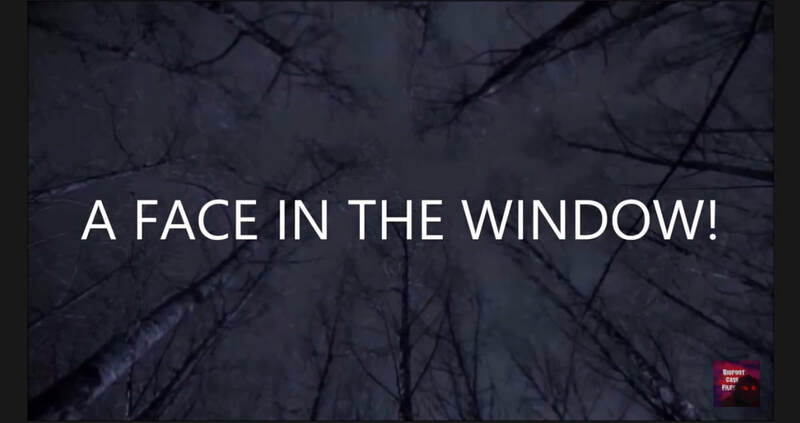 Many people, including credible researchers, have claimed unusual experiences (could not be explained) associated with sasquatch-related incidents. ​At this time, there is a significant division between what might be called the “conventional camp” and “paranormal camp” on the sasquatch issue. It is reasoned that some common ground needs to be determined for the benefit of research in this entire arena. This is an unusual presentation. 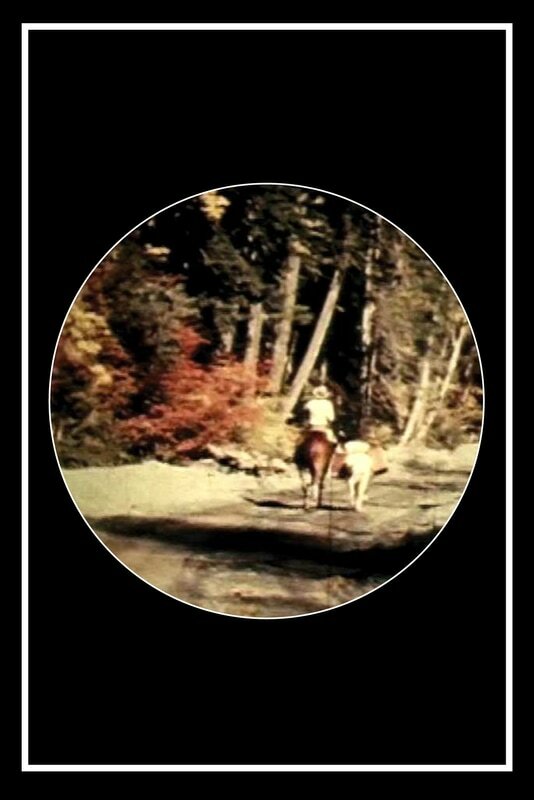 Neither the bowhunter who provided the image nor I claim that the entity shown is a sasquatch. It definitely appears to be something strange and a professional analysis will be underway shortly. The bowhunter’s reaction to my analysis was, “That’s creepy” and I have to agree. Nevertheless, there are no confirmed reports of North American “homins,” (whatever they might be) attacking people; they simply walk or run away when they are seen. One has far more reasons to fear bears. Everything currently known is presented. I have some ideas that might provide further insights and will post them as we move forward. I will provide the professional analysis immediately it is available. ​This rather epic work will soon be in print. 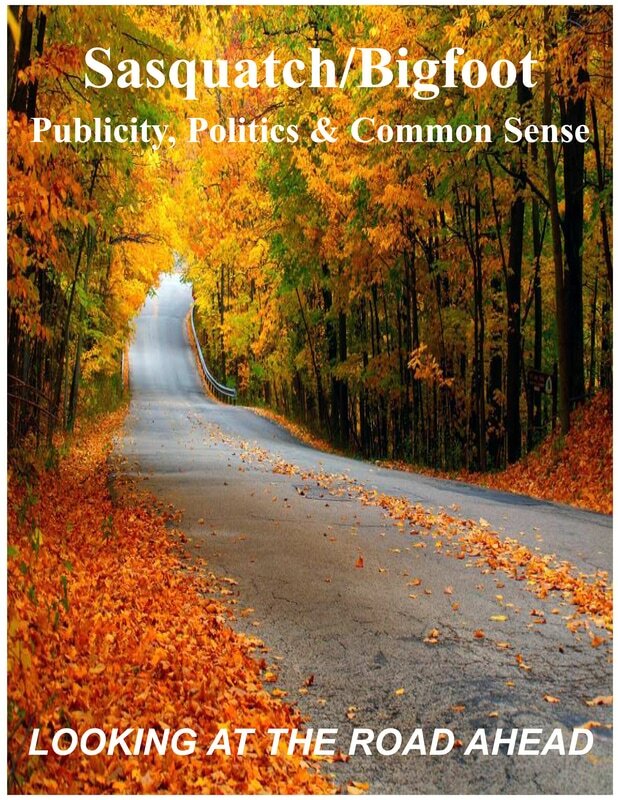 It has been featured here as an ebook for over a year. Hancock House Publishers will publish the book and the details on contents are provided in the BOOK RELEASE NOTIFICATION linked below. 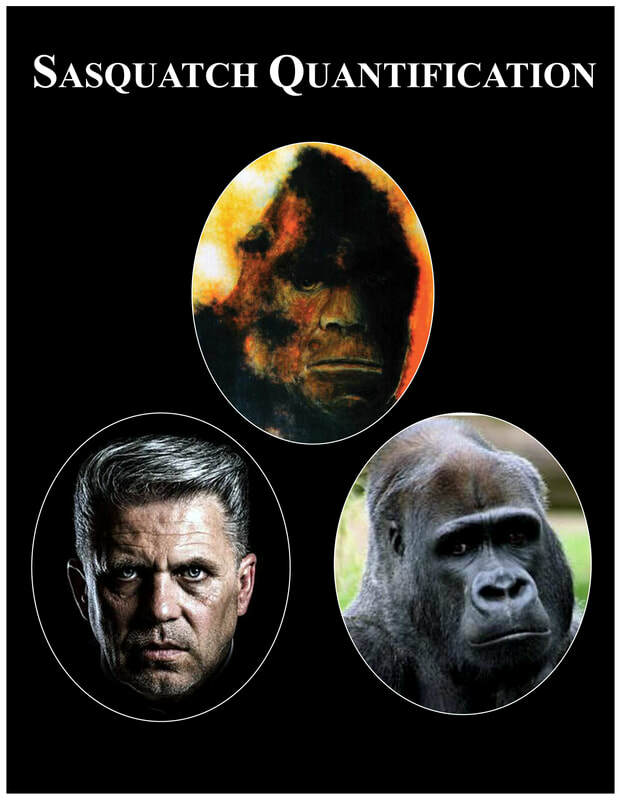 I have previously explained how the book came about, and now wish to make it clear that the purpose of the book is to get more scientific involvement in hominology (the study of human-like hominoids). We wish to have hominology recognized as a valid scientific discipline. It is only in this way that scientists will be comfortable getting involved in research. 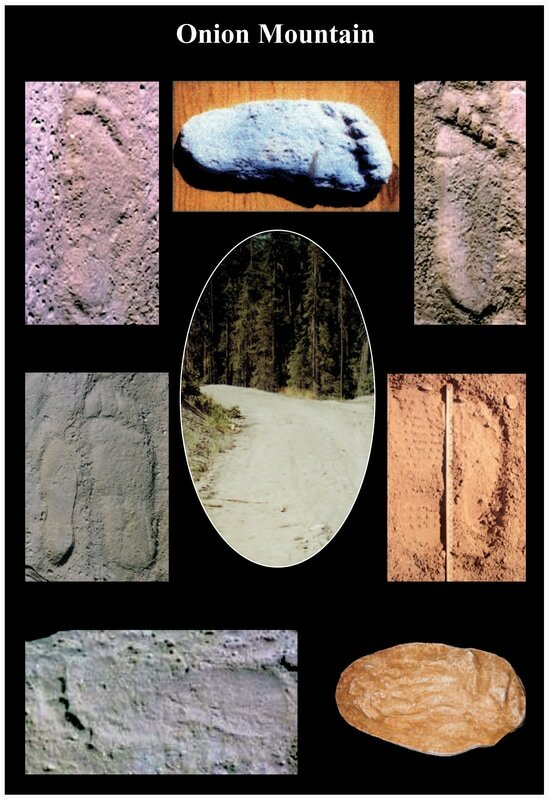 Although the sasquatch or bigfoot is the main homin, and that for which we have the most evidence, there are others and hominology covers all of them. This is not another book about sasquatch or bigfoot; it is about the need to move this homin and other homins fully into the realm of science. 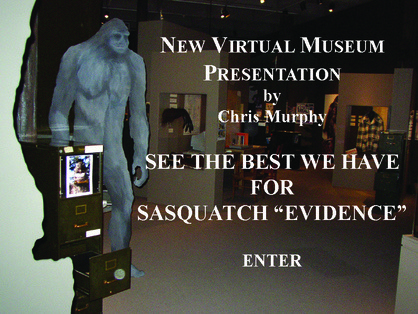 Public (government) museums in the United States are invited to host Murphy’s Sasquatch/Bigfoot Traveling Exhibit. This Catalog of Exhibit Items provides the conditions for holding the exhibit and features images and details on material offered. 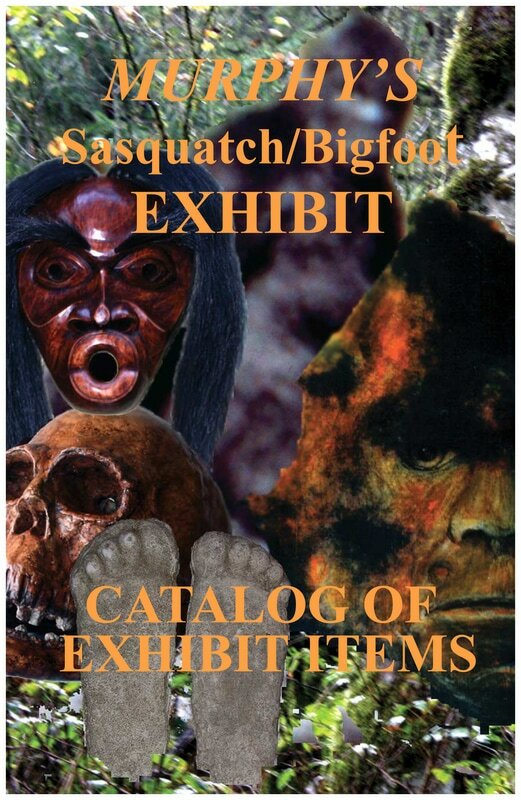 The theme of the exhibit is basically the cultural aspects of sasquatch/bigfoot in North America. Nevertheless, scientific findings are provided along with facts that imply the possible physical existence of the entity. The exhibit is the largest and most comprehensive ever offered. It has been hosted by seven public museums over the last 13 years. A minimum of about 900 square feet of space is required for the display. Please contact Chris Murphy <cmurphy101@shaw.ca> to schedule an exhibit. 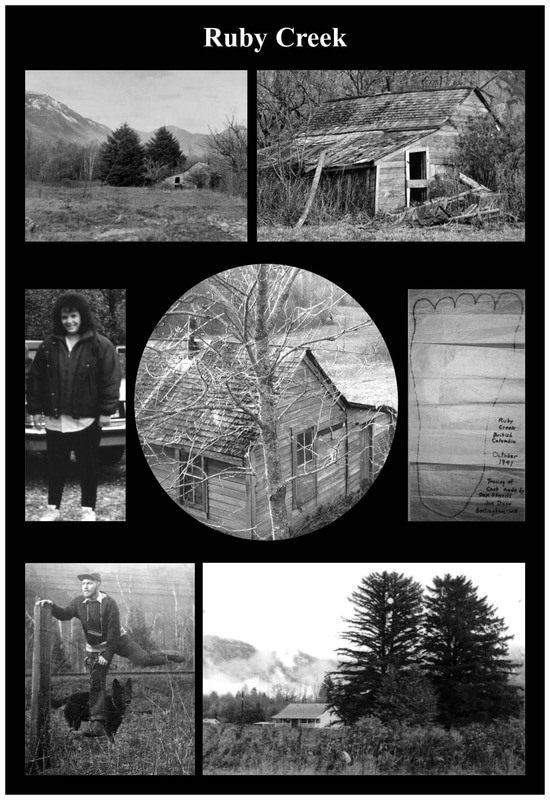 Graves who meticulously investigated all aspects of the finding and took numerous photographs. He provided a first-hand detailed report for posting on this website. We are very pleased to feature his remarkable work. 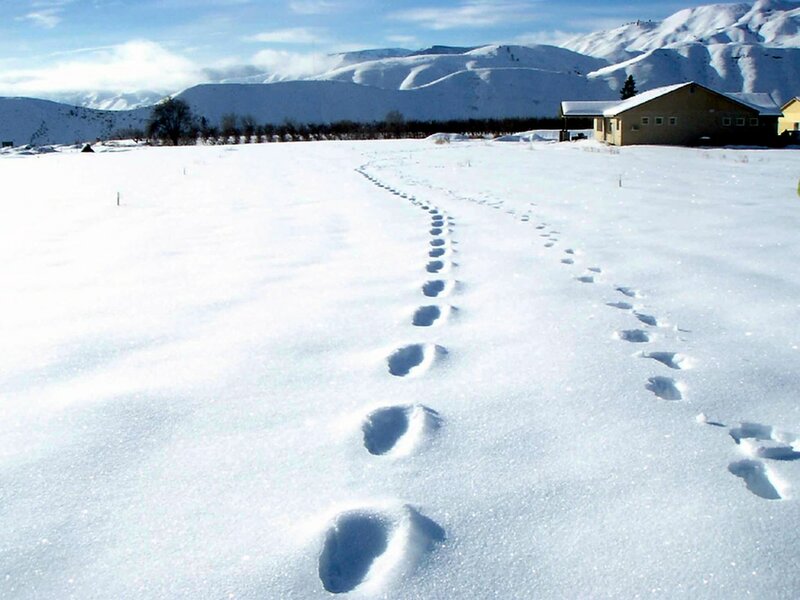 natural feet walked for over a mile in a snowfield and through residential yards. 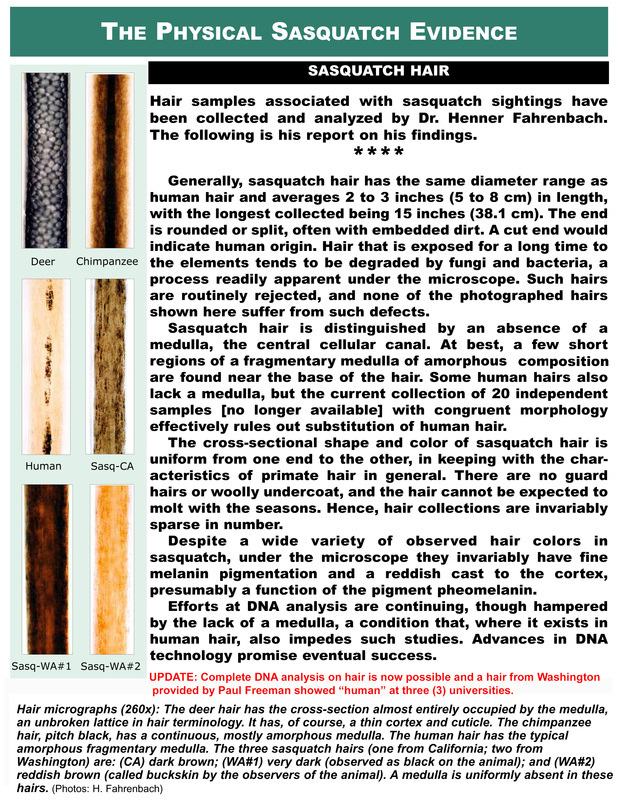 Our BC chart for sasquatch-related incidents has been updated by Kerry Clausen-Kilmury as provided here. The last chart was created by John Green in about 1980; so there have been many additions. Notwithstanding a few very early reports the 605 incidents shown span about 118 years. Kerry has created an electronic file whereby incident details (reports) are accessed when a red indicator is clicked. We are working on providing this file and will replace this image at that time. 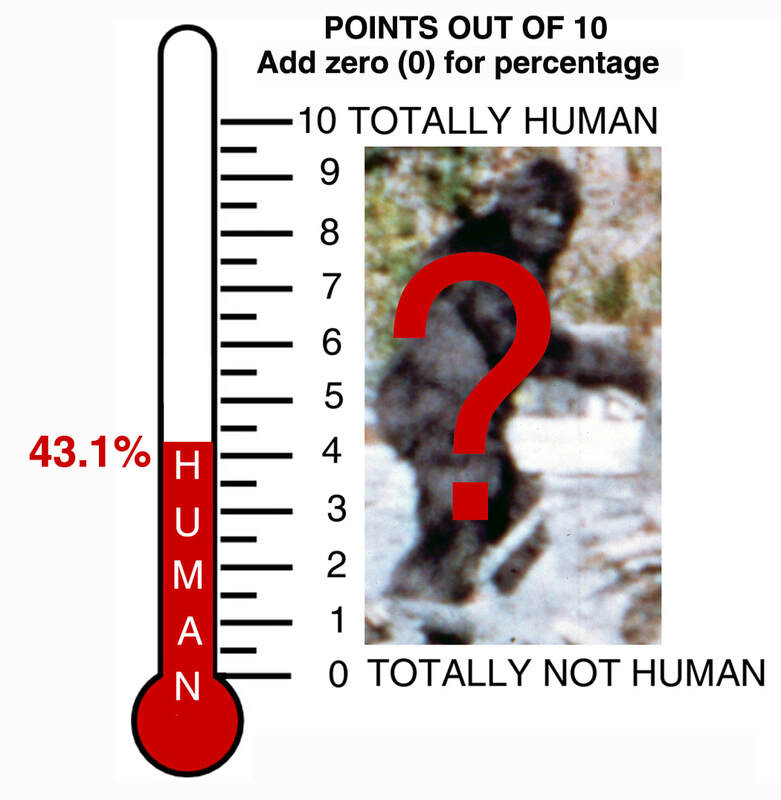 I have determined that only about 20% of sasquatch-related incidents are reported. This implies that the total of both reported and nonreported incidents would be 3,025 for the time period. ​Even if some (or a lot) of incidents might be questionable, there are definitely too many to ignore—something that looks like a sasquatch appears to be in British Columbia. ​John Green and Dr. Jeff Meldrum. They were edited by Roger Knights and Todd Prescott. ​Please click on a panel for an enlarged readable image; proceed from left to right. These posters are essentially for museums (private or public). They provide a concise visual overview of a subject and encourage the viewer to explore further. Click on the RED BOX to see details. 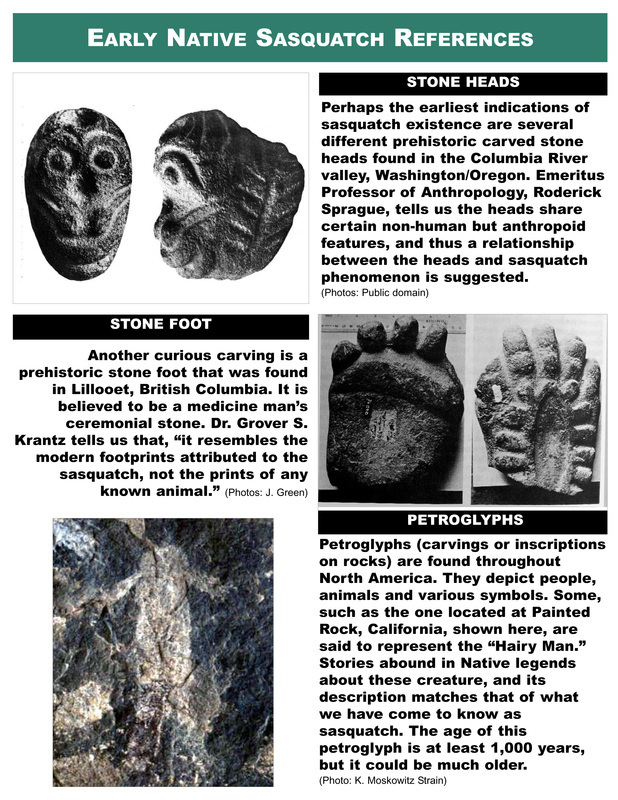 Our “magazine” contains articles both old and new on sasquatch/bigfoot and other homins. Please click on the image to see a pdf of the entire article. 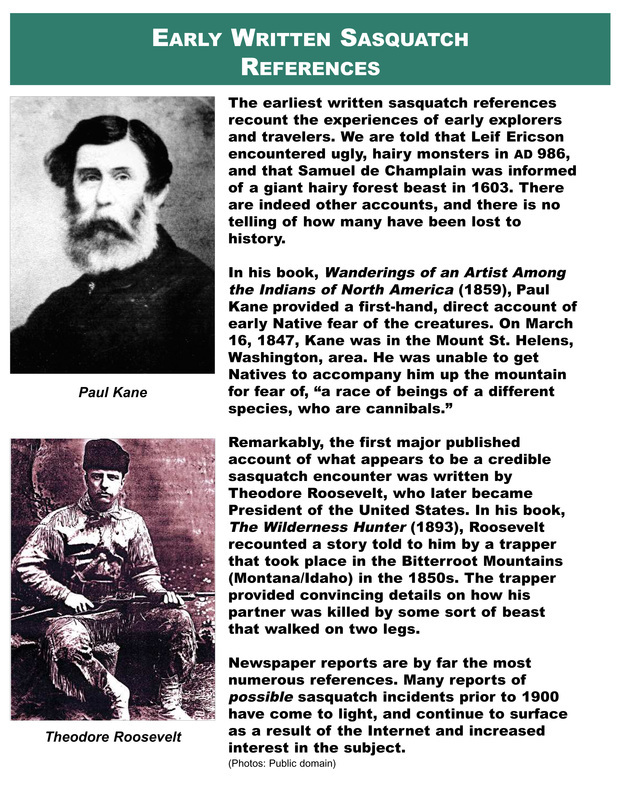 sasquatch report of the 1800s. possible sasquatch/bigfoot on the Hawaiian Islands. Considers the likelihood of bears in sasquatch sightings. 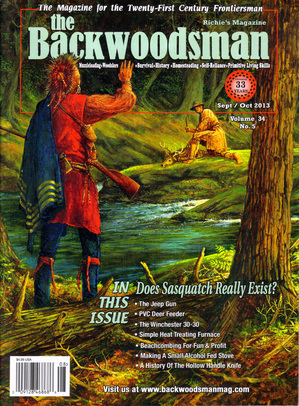 A major article on the sasquatch written by Chris Murphy with the assistance of Dr. Jeff Meldrum and Todd Prescott was featured in the September/October 2013 issue of The Backwoodsman magazine. 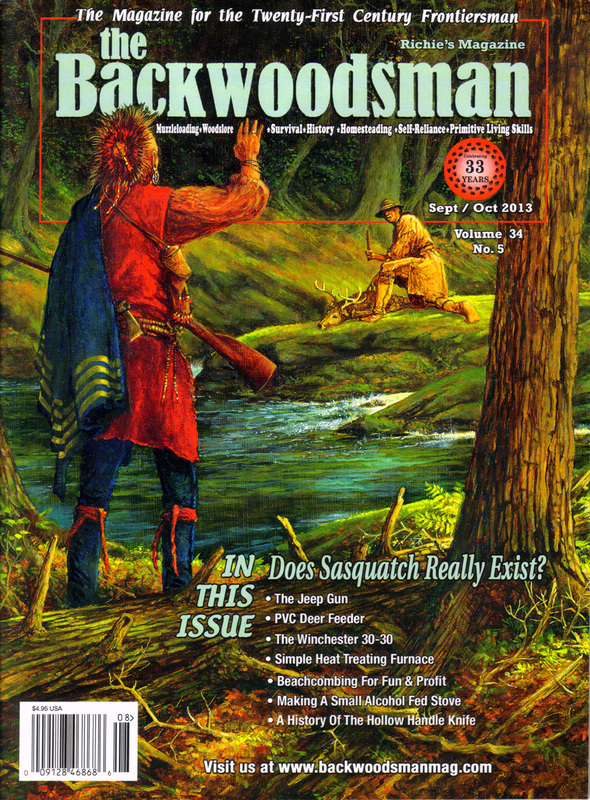 The article "Do Sasquatch Really Exist?" provides current information on the evidence we have as to the creature's existence. 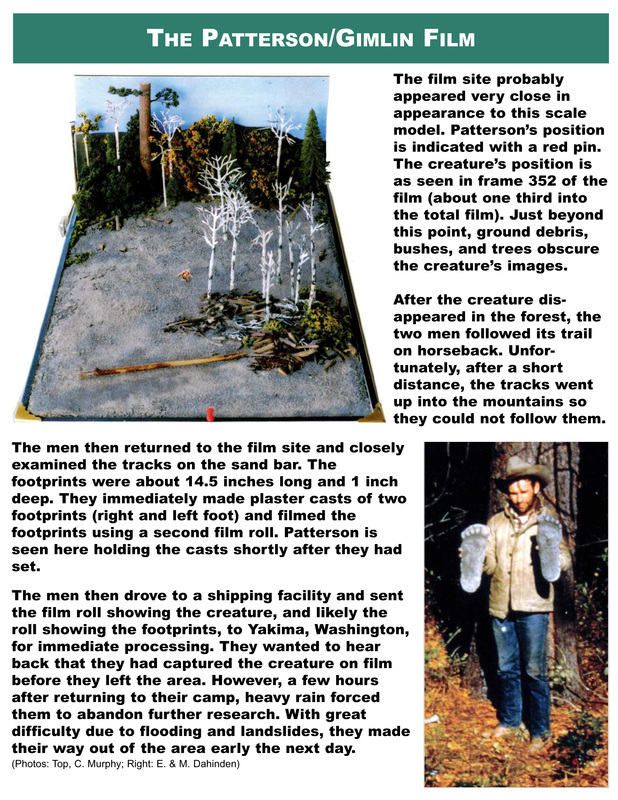 filming of a sasquatch/bigfoot by Roger Patterson and Bob Gimlin. Conferences or other events during the year will certainly highlight the anniversary. providing talks or write-ups on this remarkable filming accomplishment. doubt that 50 years is a long time for something of this nature to defy even the most detailed scientific analysis as to the reality of the subject filmed. ​In 1994 Peter Byrne commissioned a scientific evaluation of the Patterson/Gimlin film by Jeff Glickman, a noted forensic scientist. 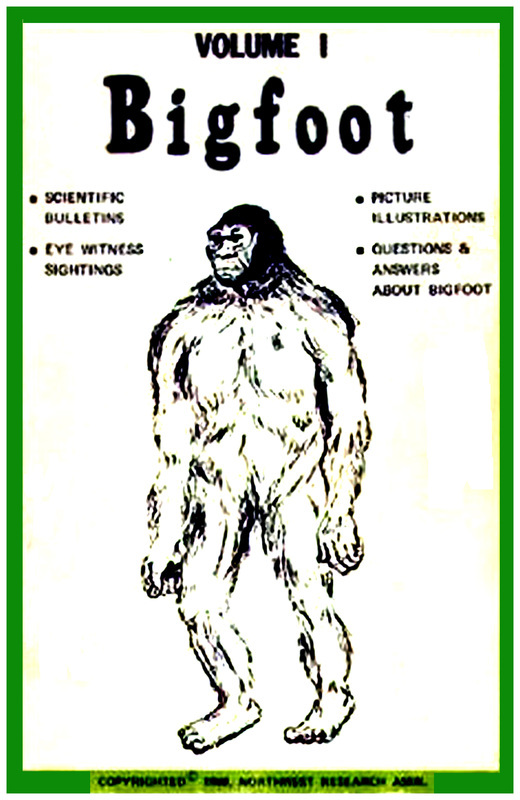 Given the analysis was favorable as to the reality of the bigfoot filmed, the original plan was to distribute the report free of charge to universities worldwide. The report was provided in 1998 and was favorable, but the plan was changed to having it published in a scientific journal. Unfortunately, such could not be found. With the passing of time, the final alternative was to publish the report is a book for general marketing with full coverage of the filming and including all the clearest film frames. A book was created by Chris Murphy, but due to restraints was not published. Nevertheless, the restraints did not forbid the publishing of the report itself (exactly as provided). For marketing reasons this option was not practical. The pdf of the report provided here is the full color version intended for publishing. It may be printed for personal use but must not be used in a commercial publication or sold. NOTE: The North American Science Institute (NASI) is now defunct. how scientists have now effectively abandoned the subject. You will be left with the question, how could so much be ignored? . 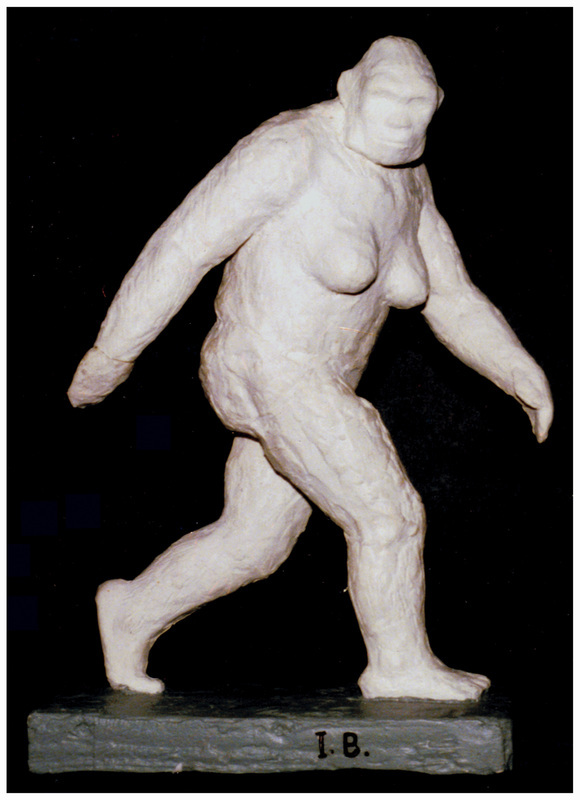 how the bigfoot would have appeared given she could have been filmed along 360 degrees. The relative height and mass of the subject is also discussed as it compares to about a 6-foot tall man and Roger Patterson himself. ​NOTE: A special slide presentation on the P/G film subject is provide HERE. been in Native culture for probably thousands of years. and leave it to the reader to sort out. Murphy. All gave excellent talks. 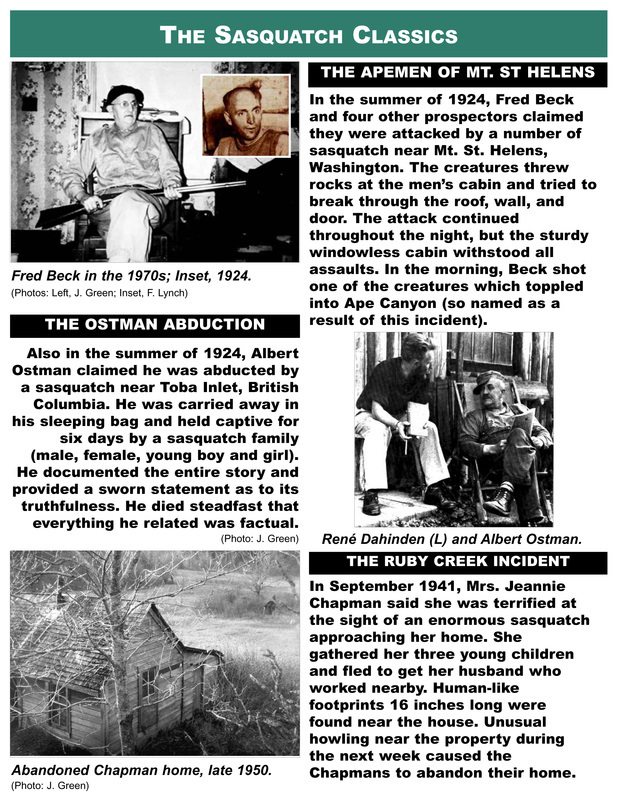 the recent history of sasquatch investigations. there are still some questions. later at age 89. He will be long-remembered. We hope you enjoy the video. 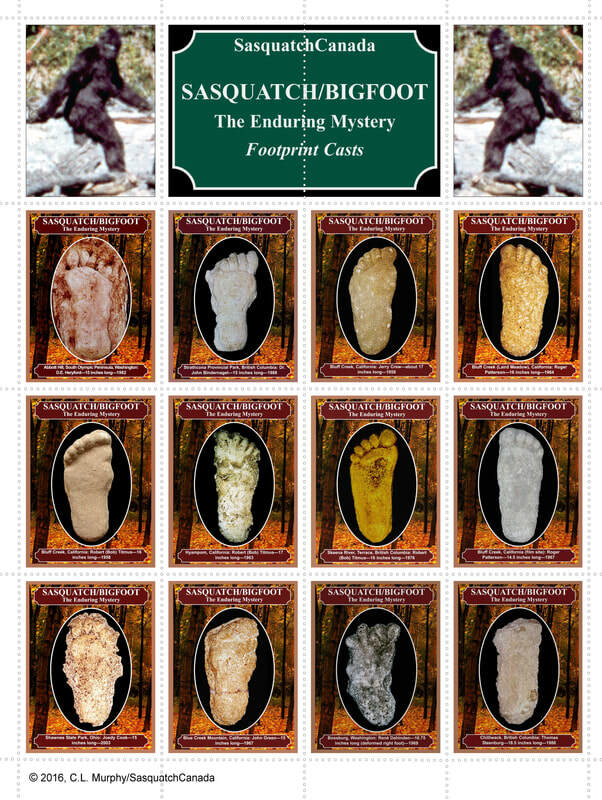 With so many sasquatch sightings and observations as to food, we can now start to look at how the beings sustain themselves in the wild (where most of them exist). Animals that they kill for food are essentially obvious (same as other predators). We have enough information to categorically state that sasquatch are omnivorous (eats meat and vegetables) exactly the same as humans. applies to the few that venture into such areas. 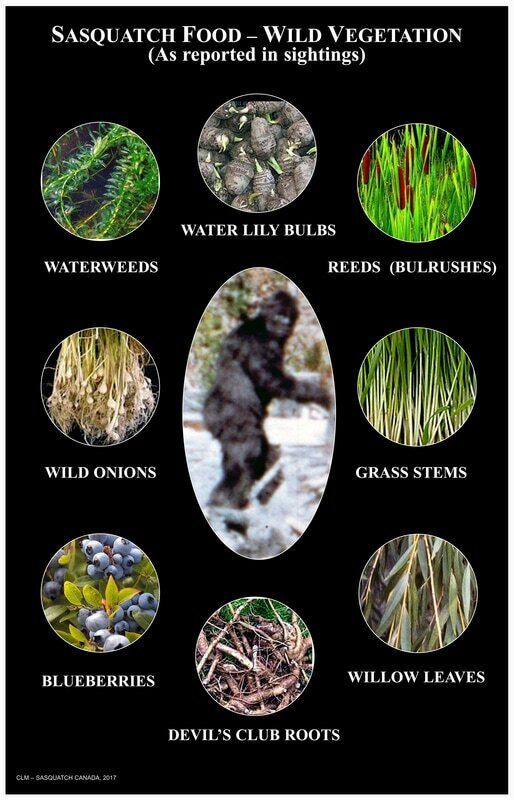 Here is a look at what we know about wild vegetation that forms a part of sasquatch diet. 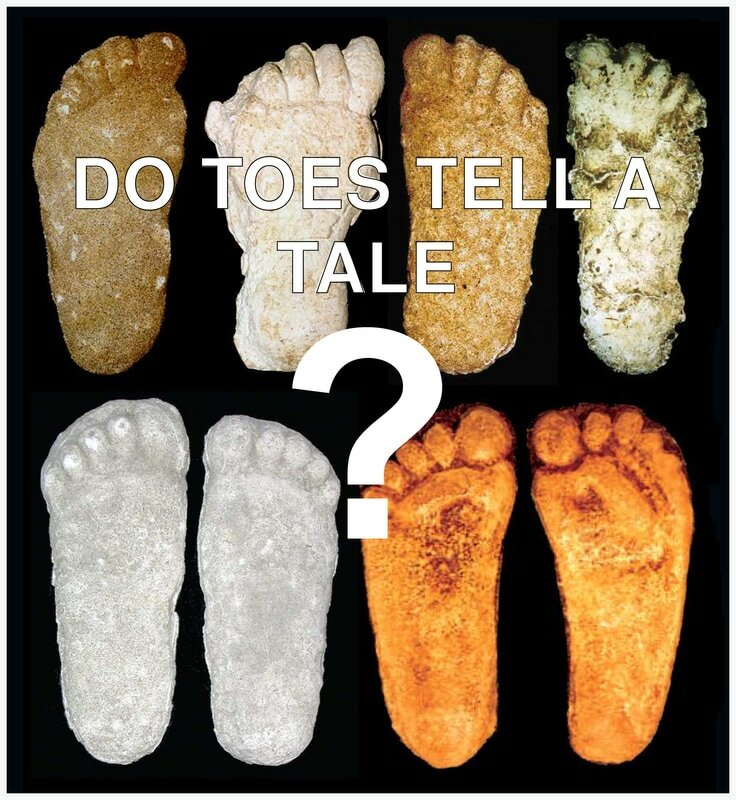 Do Toes Tell a Tale? prints. 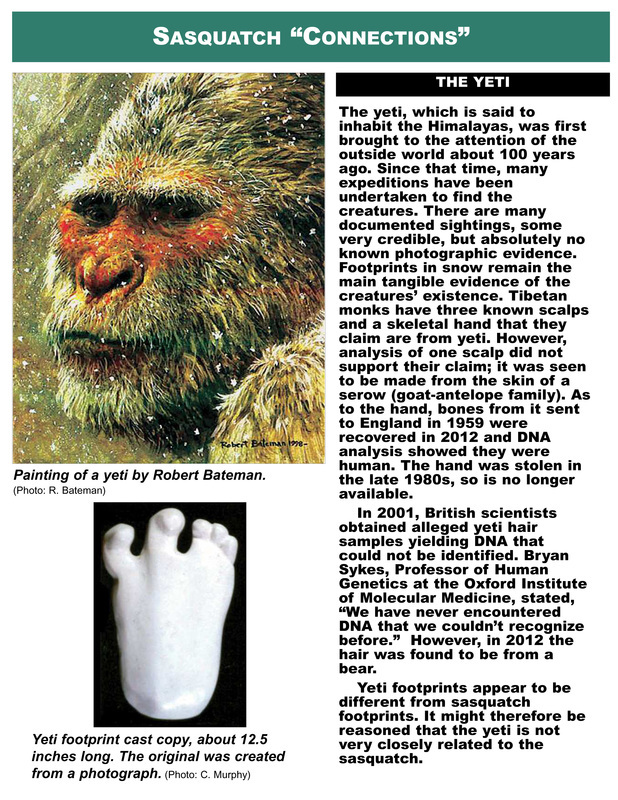 Indeed, “science” acknowledges that the prints are made by some sort of primate. The main question is, what kind of primate? 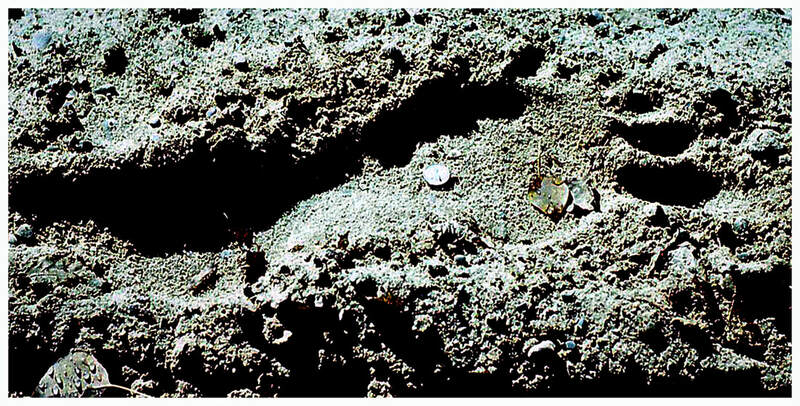 Remarkably, human toes and sasquatch toes have something else in common beside functionality—they fall into at least three of the same classifications or categories. ​The relationship between a sasquatch, human, and a great ape (such as the gorilla) cannot be established until we can obtain confirmed sasquatch DNA. Even then, science will not be satisfied until a type specimen in “put on the table.” Nevertheless, we can take what we have and apply a little arithmetic and logic to arrive at what we might expect. This analysis surprised me somewhat; I was expecting something very different. Indeed, it could be that our scientists and John Green just might be right as to sasquatch nature. This still does not justify intentionally killing one for “science,” but moves things a little that way. Whatever the case, my conclusions are just a few more “sign posts” along the way; there are a multitude of other considerations. ​The question of what a sasquatch truly looks like continues to evade us. 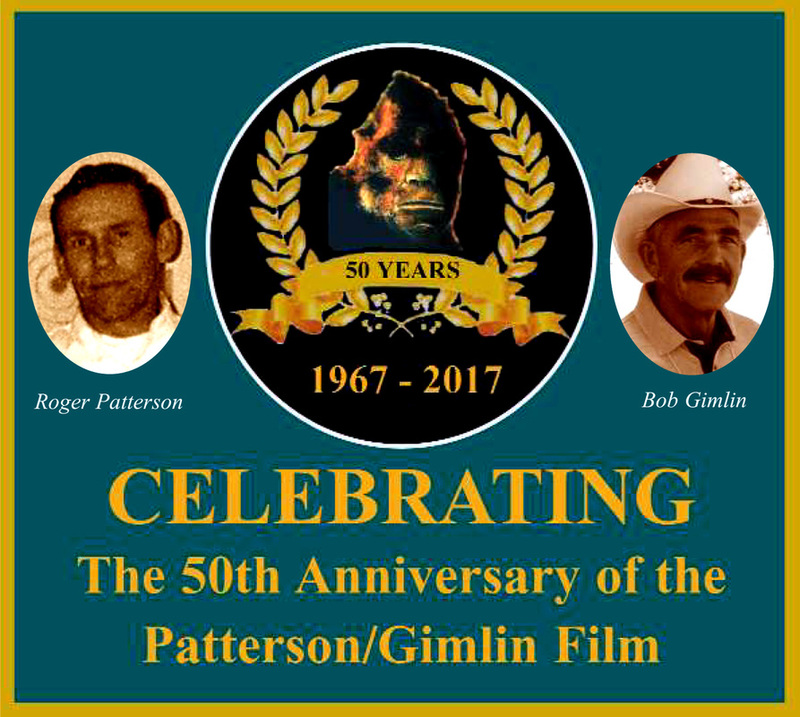 The Patterson/Gimlin film shed a little light, but details are greatly lacking. The images in this film are still the best we have. Witness descriptions and rough sketches have to be used to “fill in the blanks,” but differences and uncertainties still leave us guessing on many aspects. In this paper I present a sculpture I recently created, which attempts to apply more logic in determining sasquatch facial features. All aspects are discussed providing the reasons for the size, shape and color of the features. I am sure there will be considerable disagreement, but that “goes with the territory.” I have simply done my best with what we have. ​From what we know, sasquatch hands are both human-like and great ape-like, but with one major exception: sasquatch thumbs are not opposable. 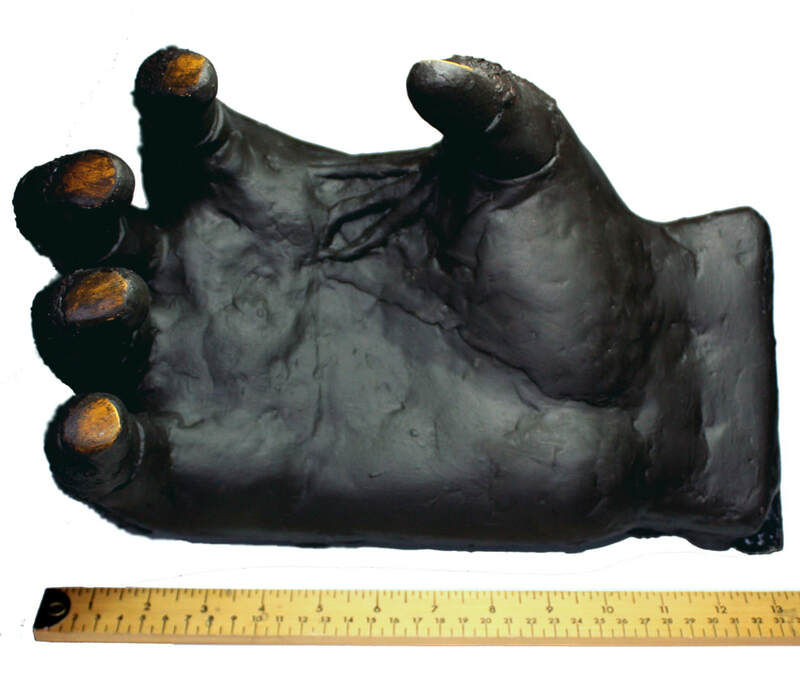 From an artistic standpoint, sasquatch hands might appear as the sculpture/model image provided here. 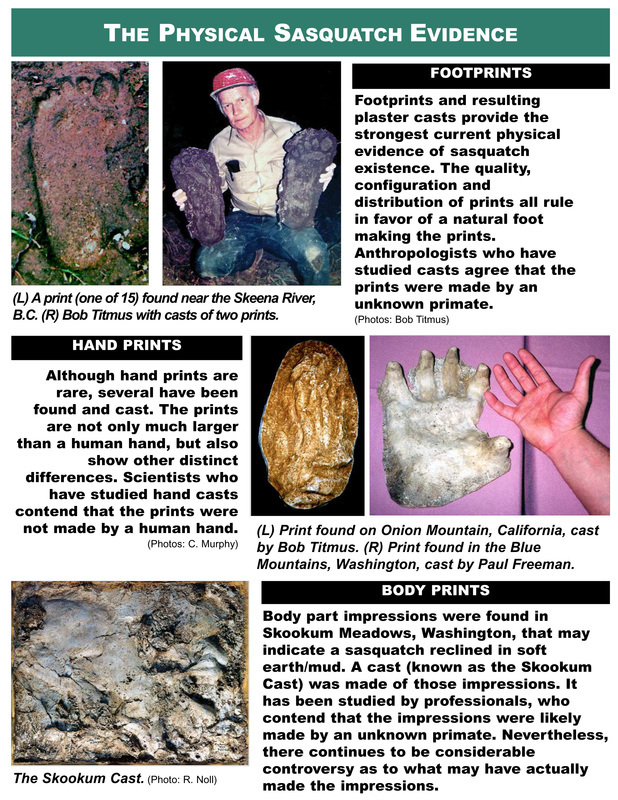 In this paper, I explore the information we have on sasquatch hands as to probable size, configuration and sasquatch stature. Remarkably, three casts referenced and a witness drawing support conclusions. 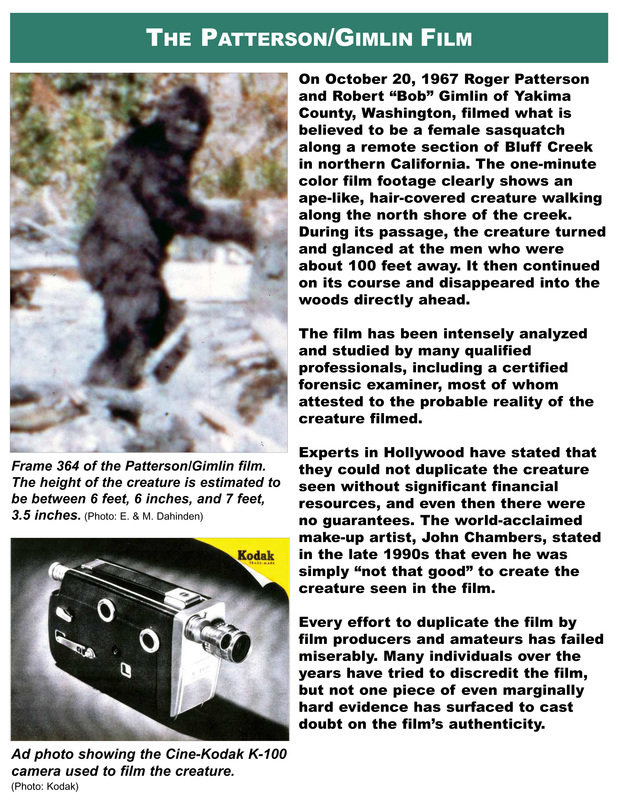 From the moment the Patterson and Gimlin film was first screened in 1967, the question of whether the “creature” seen was ape, human, or in between has raged. Scientists at the time generally dismissed the film so the question was hardly professionally entertained then and indeed to this time. 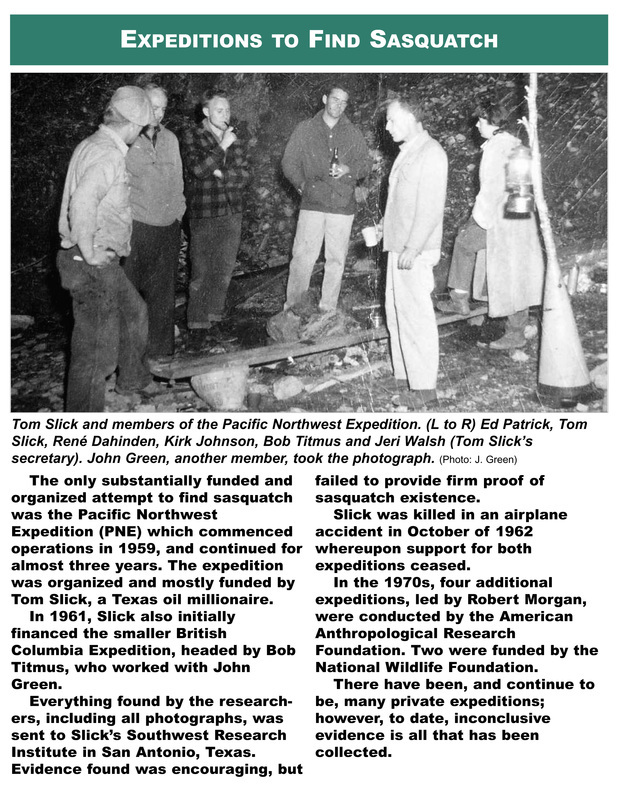 There was, of course, much more evidence for sasquatch existence in 1967 than just the film; however, such evidence (even if known by the scientists) would not have been considered because it was not directly related to the film. In the past 50 years much more information on the film has been determined and other evidence and testimony now fills numerous books and websites. This has prompted me to go back to the question stated above and give it more thought. This paper is an attempt to address that question in a systematic way. This is not science; I have provided a simple business process that is used in multiple decision situations. North, which would not have differed significantly from their homeland. ​Photo Complications - Is there a Mystery? ​Sometimes the passage of time raises more questions than fewer. Naturally, the P/G film has been subject to extreme scrutiny and all the journalists, would-be journalists, and others form opinions. From there everything drifts into books and onto websites. Eventually, everything gets checked, but by this time it’s too late to change what is in print and if those with websites don’t stay up-to-date, things stay as they are. The complications that arose with the images seen here have been addressed, but not together and not as thoroughly as I am now presenting. I don’t think this will be the “last word” on this subject, but it’s a step toward that end. 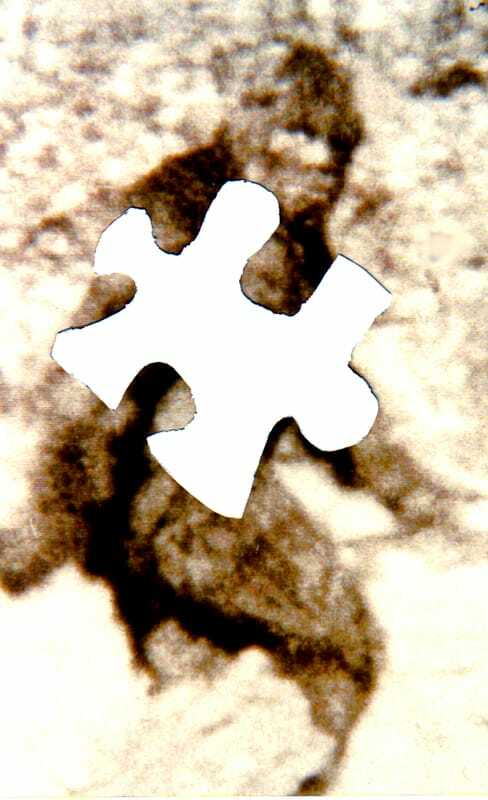 When images (Cibachromes) from the P/G film became available to me, I naturally wanted to see if more details could be observed by magnification with a magnifying glass. I graduated to photographic enlargements and then to scanning when I obtained a scanner. I was eventually informed of “maximum credible detail available” in the images, so ceased this research. Nevertheless, along the way I did something that was totally inadvertent and “unscientific,” but produced what I thought were better images. According to the mathematics, details I could see were not there, despite being in the right place. I still wonder if they and other oddities observed are in fact there. Whatever the case, here is the story. would not know that story because it depends on circumstances and general “non-scientific” knowledge. One can look at a photograph and certainly tell you what is seen, but he or she cannot tell you about its circumstances (why the subject is there, where it came from, when it got there and so forth). That information is not known unless it is determined by research. something, but ten images can provide an entirely different impression. ​In 2006, I did an overhead projector presentation (on video) at a conference in Vancouver, BC (UBC I believe). 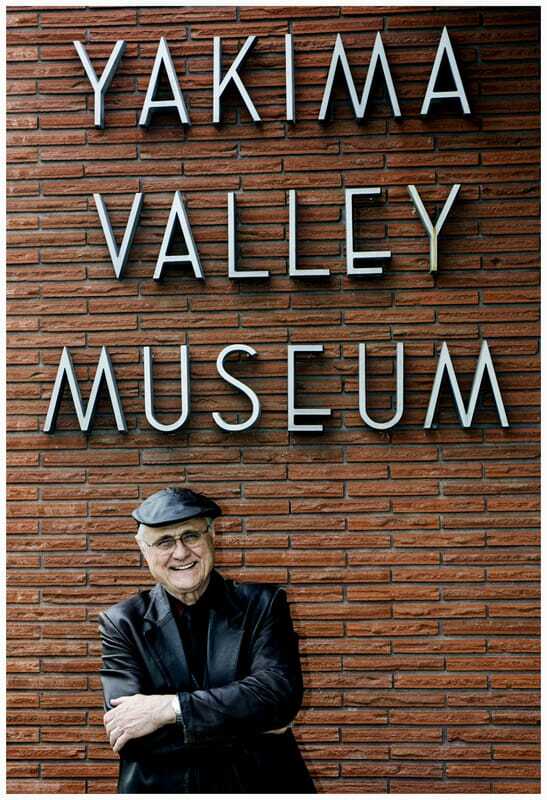 I still had some artifacts loaned to me from my Vancouver Museum exhibit in 2004 and had displayed them. The presentation was called “Between the Lines.” I presented images of artifacts provided in the exhibit and explained various aspects that were transparent to visitors (what, when, where, how sort of thing). I also went off on a few tangents and explained things in other directions. Everything is essentially the same, although there are a few things I might now change 12 years later. This is a very long-winded presentation, so be prepared. It’s intended for very dedicated researchers. 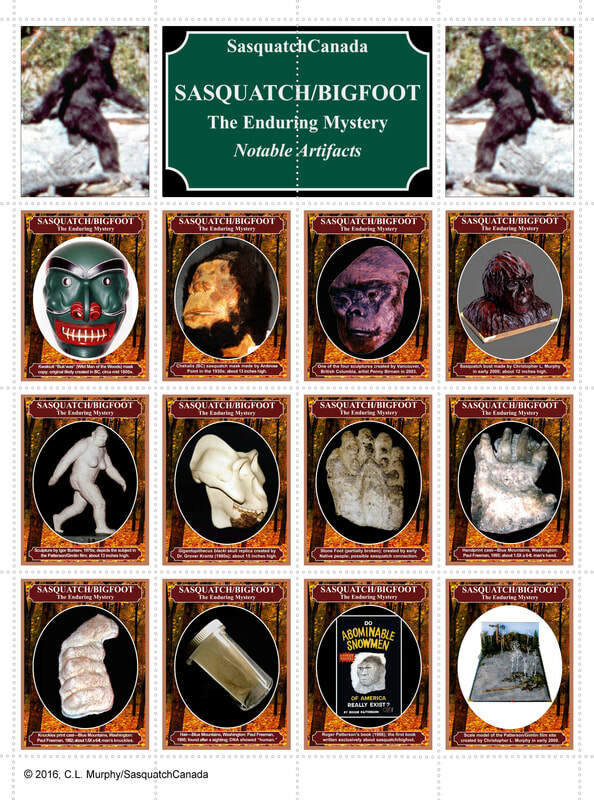 stamp sheets, which are provided for display in museum exhibits. the most notable artifacts besides footprint casts. sold on-line, but may be available at museum exhibits (gift shop item). we just did not know in the past enter the equation and make sense of troubling situations. The sasquatch/bigfoot issue is a mass of information and missinformation, made all the worse by those who “jump in,” make a mess of things, and then disappear into the woodwork. personal perspective, but I was there all the time, not bouncing around from pillar to post taking potshots. 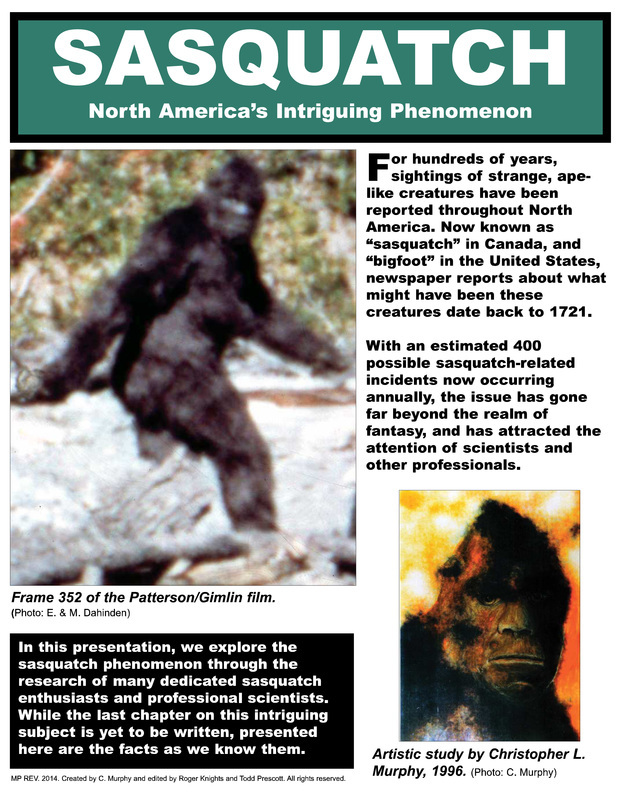 ​​Although we have come a long way in our quest to get proper attention to the sasquatch/bigfoot issue by the scientific community, we have not gone far enough. At this point in time, it is important to look back at where we have been and then look at the road ahead. This presentation explores the past on a “first hand” basis for 24 years and attempts to evaluate the entire issue and offer a plan for going forward. not learn history are doomed to repeat it." 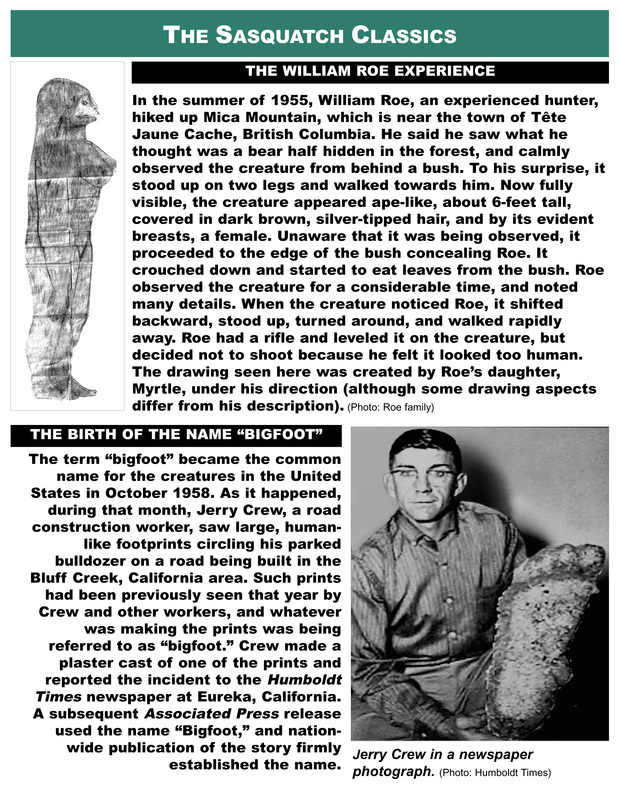 The “modern” history of the sasquatch/bigfoot issue goes back about 60 years, and we are not “learning” as much as we should. Advances in technology have certainly helped in our research, but such has its downside. Perhaps we need to “go back to basics." 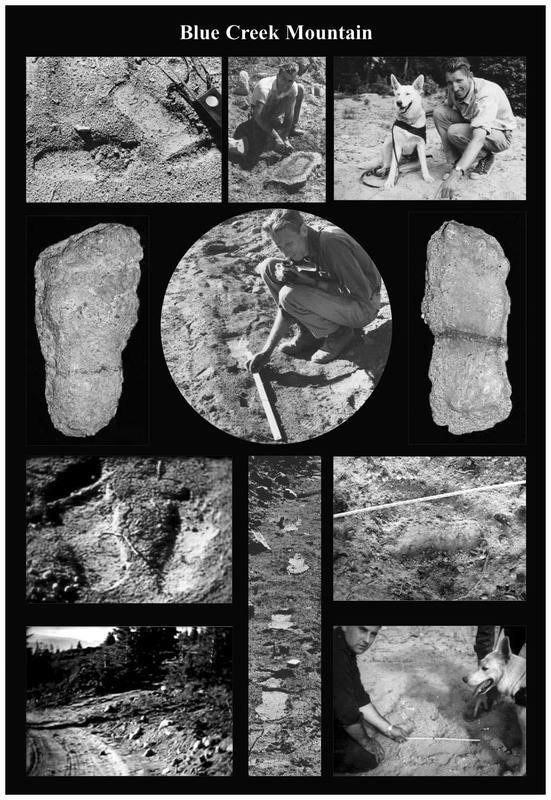 Chris Murphy and Thomas Steenburg have teamed up again to update their epic book Sasquatch in British Columbia on line. 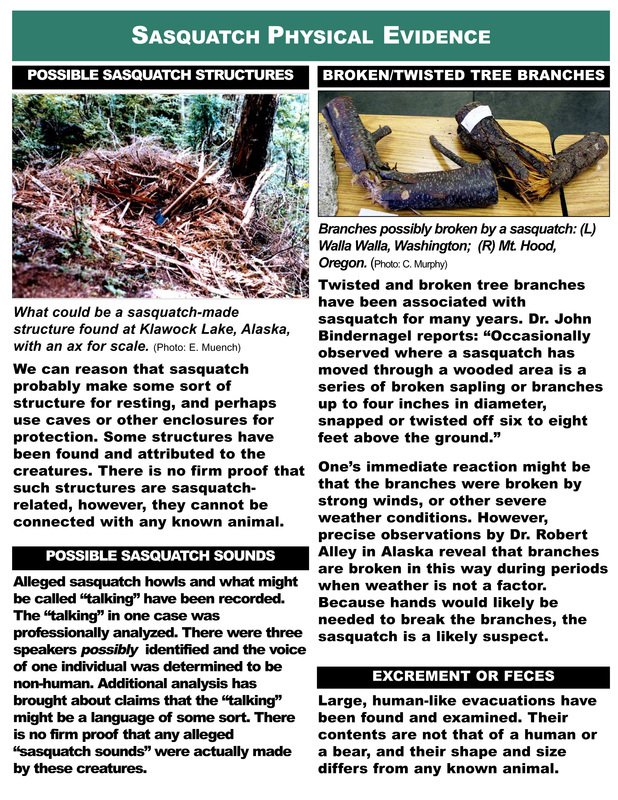 Since the book was published in 2012, there have been more sasquatch-related reports and other noteworthy events. This material will be posted in this section in the same format as that provided in their book. Furthermore, as new incidents are reported and investigated they will be added. 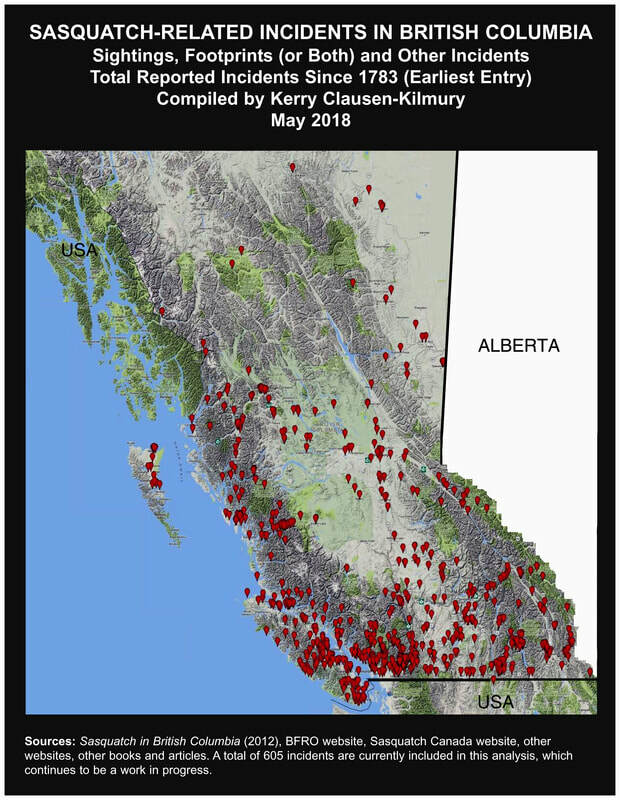 Thomas Steenburg is the primary field researcher in British Columbia. His investigative techniques are very thorough, so you can count on more excellent and credible reports. Click on the DATE/INCIDENT line to see the full report. Portions of this website are reprinted and sometimes edited to fit the standards of this website under The Fair Use Doctrine of International Copyright Law as educational material without the benefit of financial gain. This proviso is applicable throughout the entire Sasquatch Canada website. 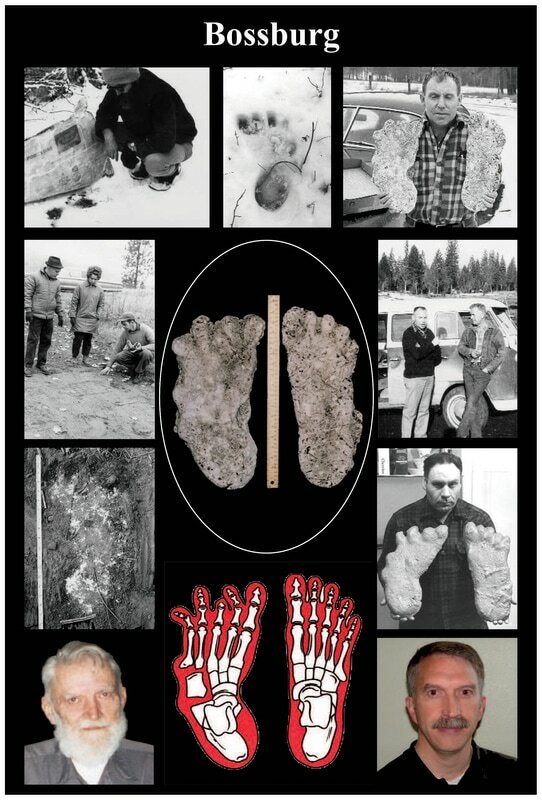 Sasquatch Canada presents these photos, audio clips, videos and all documentation for educational and commentary purposes only and does not claim any ownership or liability.